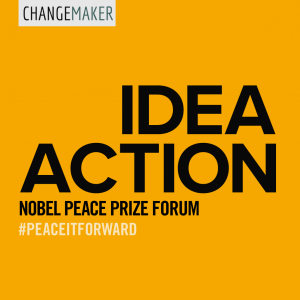 Leading up to this year’s forum, the Nobel Peace Prize Forum is collaborating with Changemaker to launch a podcast mini-series featuring some of the speakers. We’ll learn how they came up with their ideas for peace and what steps they took to make a change. The first episode features Isabel Pérez Dobarro, project leader of the Sustainable Development Solutions Network (SDSN) Youth Initiative’s project Arts Twenty Thirty, and a concert pianist. Pérez Dobarro was in law school when she discovered the Sustainable Development Goals- a global initiative set forth by the United Nations for solving the world’s biggest problems. Arts Twenty Thirty uses the arts as a tool to raise awareness of the Sustainable Development Goals, and engages a network of artists committed to sustainable development. Through the initiative, she has organized artistic events in Vatican City, New York, and Madrid, and elsewhere, and has used art to connect with audiences to inspire global change. Pérez Dobarro represented SDSN-Youth at the Winter Youth Assembly, and at the High-Level Debate on the Sustainable Development Goals and at the High-Level Signing Ceremony of the Paris Agreement at the United Nations Headquarters, among other events. She is also the Western European Representative of the Fair Air Coalition organization. At the forum, Pérez Dobarro will participate in several sessions concerning the roles of artists and youth in creating peace, fostering healing, and engaging in dialogue. We are very excited to hear from her, and hope it will inspire others to get involved. Learn more about Arts Twenty Thirty. Explore the Sustainable Development Goals.